Happy 4th of July! and Not Lost. It has poured buckets and buckets of rain all day and everything is good and soaked and I feel that there is very little chance that anything could catch on fire from fireworks tonight. So I guess this is good. John is at work, so we will just “celebrate” separately, for now. Tomorrow he’s off and SIL will stay here for a bit with H and we will brave the hordes and go…somewhere. I will leave you with some images from Nana and Pop’s house… because I feel like everybody should be able to go to such a neat, wonderful place and I wish I could take you all. 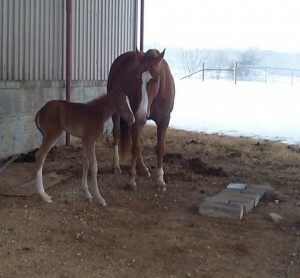 Here is Ricochet. 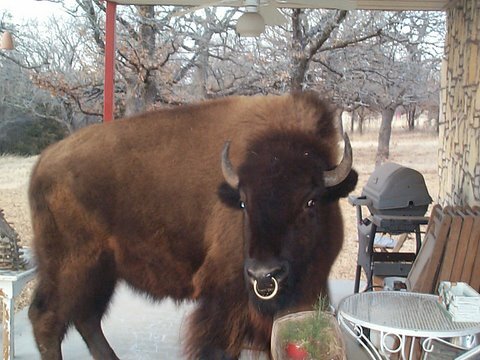 He has wandered up onto the back porch again. Silly thing likes to look in the windows. He really should have been named “Tom”, as in “Peeping”. 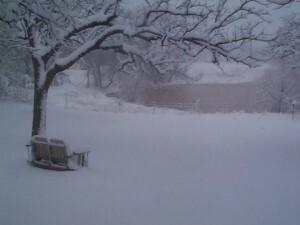 View of the pond from the back porch during a really good blanket of snow this past winter. Just a few hours old colt, during the same snow. Do they ever invite Ricochet to hang out on the porch and have a beverage ? heehee! These are amazing pictures. I love the buffalo on the back porch!